"Greetings, citizen," says Marshal Dughan. "How can I-"
"So the General can teleport in, arrest people, and then teleport them directly to the stockades?" Norman cries angrily. "I don't know, maybe," Dughan stammers. "So WHY did you post Hogger to the job board, then? Why waste my time if the general was just going to arrest him?" "He did WHAT? Great, now we have a bloodthirsty beast right beneath the streets of Stormwind, with a whole army of gnolls at his command. Definitely an improvement, I feel safer already. Here's your reward. But promise me you'll check in with the Stockades guards in Stormwind at some point, just to ensure that things are going smoothly." "Waaaait a second," Norman says slowly. 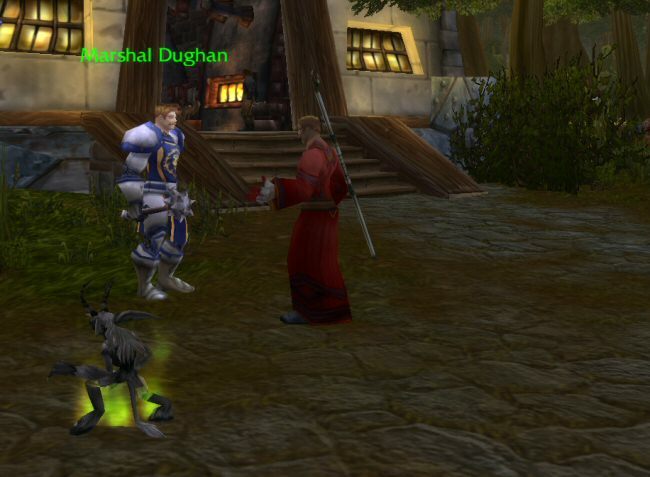 "Are you saying Hogger is TOO DANGEROUS to be kept in our own stockades?" Dughan gives one of his little shrugs. "THEN WHY DID YOU POST IT TO THE JOB BOARD? You're telling me this job was piss-easy for the general, and too dangerous for me, and it's a pointless waste of time anyway since he'll just escape!" "Here is your reward," Dughan says calmly. "Thank you. I hope you die in an avalanche of Kodo waste." This quest is actually a set-up for a dungeon you can run later. 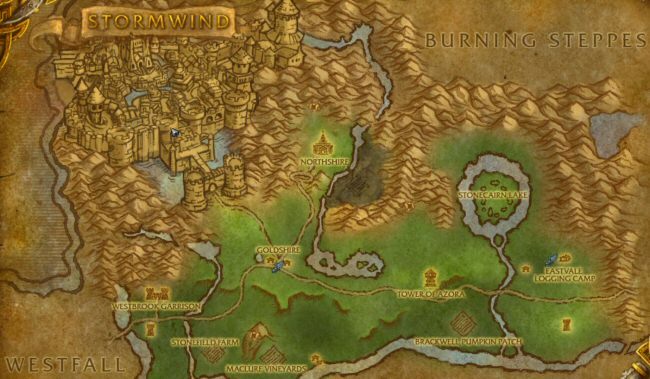 The Stormwind Stockades are one of the lower-level dungeons in the game. You can go there in your twenties and fight some bosses. 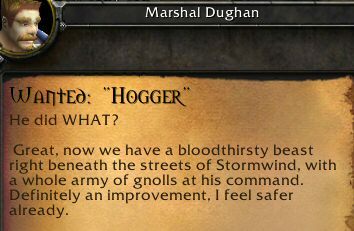 I haven't done them, but I've read that the quest to go in and kill Hogger is level 30-ish. In case you're wondering, the quest we just did was level 11. We leave town in a hurry. Someone stops us along the road to ask for help, and Norman cracks them on the shins with his staff as we jog by. "Nice follow-through on that one, boss." We head west, making for Westfall. 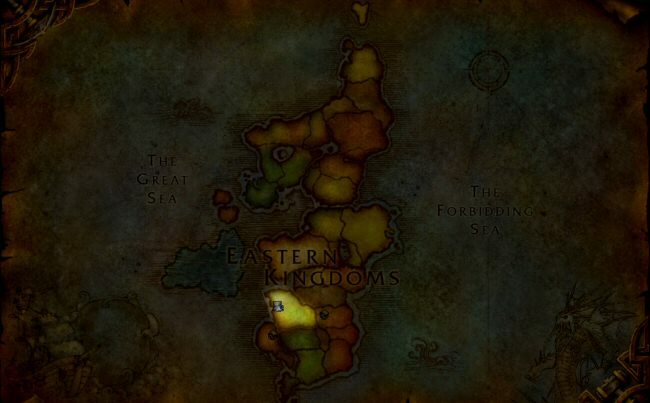 And Azeroth is one of two worlds in the game. 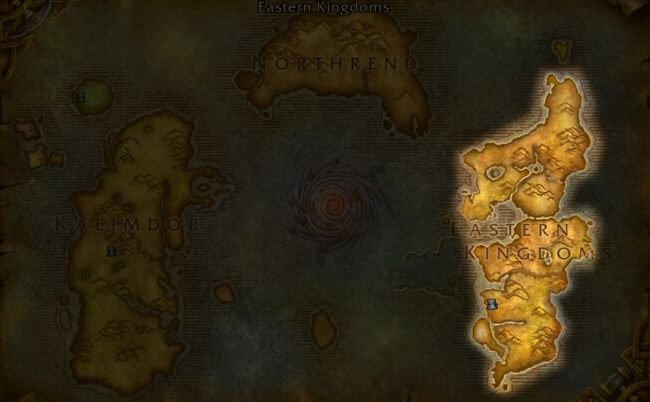 The other, Outland, isn't quite as big as Azeroth, but it's still huge. and there are a couple more high-level continents tucked away here and there that I haven't even visited yet. 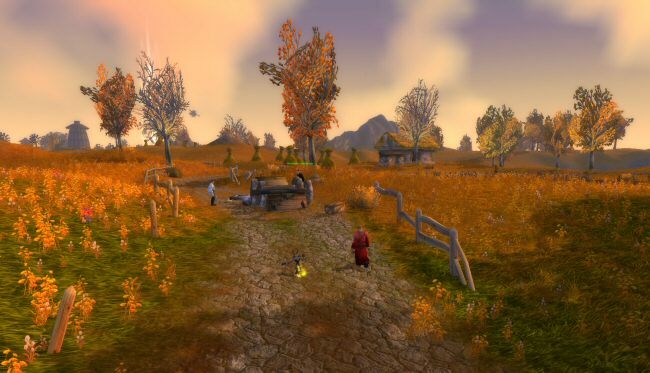 Westfall. For some reason, crossing the river has moved us from eternal summer to eternal autumn. Whatever. Not my problem. Looks like there's a crashed cart here. And some dead people. I like this place already.